As an R/C enthusiast and reviewer for over a decade, I’ve had the opportunity to test nearly all of the world’s smallest aircraft, but the D1 Drone from DHD is by far the smallest and best flying aircraft I’ve ever experienced. Also, considering it costs less then 20 bucks, it’s an aircraft that almost anyone can afford. The title of “world’s smallest aircraft” is thrown around a lot these days, and there are a few different categories of aircraft that use that designation, including quad rotors, helicopters, airplanes, blimps and ornithopters, just to mention a few. The Picoo-Z was what really started the craze a few years ago, as it was only 6.5 inches long, took a lot of skill to fly, and had plenty of limitations. Next was the Air Hogs Atom, which was about 4 inches long, but almost impossible to fly. The 3.5-inch long Air Hogs Pocket Copter was followed by the 3.25-inch long Nano Falcon. Recently, the new Silverlit Nano Falcon-XS coaxial helicopter was released, measuring in at just over 2.375 inches long. Although these aircraft are all impressively small, they all lack a level of control that full-sized aircraft have. Most of them are only two- or three-channel aircraft and none of them can fly outside, or even fight against strong air-conditioning. 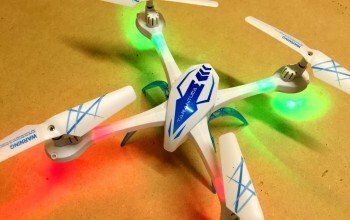 The Cheerson CX-10 quad rotor was the real game changer. It was one of the first fully functional 4-channel aircraft to break the 3-inch mark, but it still wasn’t the world’s smallest aircraft, because measuring at just 2.5 inches long, the CX-10 was almost a quarter of an inch longer than the Nano Falcon-XS. Now, the DHD D-1 drone has stolen the title, measuring at less than 1.75 inches wide, it is truly the world’s smallest aircraft. It’s also much shorter than the 1.75-inch tall Nano Falcon-XS, and the D-1 Drone is only .75 inches tall, a full inch shorter! Not only is it smaller, it’s also more functional; it’s a 4-channel gyro-stabilized aircraft that can fly outside, unlike the 3-channel indoor-only Nano Falcon-XS. The small size, stable flight, and its ability to fit inside the transmitter are the defining aspects of this aircraft, along with its low cost. The small size is truly something to behold… pictures just don’t do it justice. I was impressed the first time I saw a Cheerson CX-10, but I was blown away with the DHD D-1 drone. Nothing else even comes close. Each rotor blade is less than .875 inches long and barely looks big enough to work. They look like little rotors from a G.I. Joe toy, but they really do work. The stable flight is also incredible; apparently, the smaller quad rotors get, the more stable they become. Being able to put your aircraft inside the transmitter and slip it in your pocket is also a great feature. I have to admit that the range is also pretty good for such a small aircraft with only 2 AAA batteries in the transmitter. In fact, I was able to fly it more than 50 feet away. There are 2 shades to choose from: powder blue and powder yellow. The outer shell is very reminiscent of a DJI phantom or a Cheerson CX-10, but it has its own style and flare with slimming curves sculpted on top. The bottom of the aircraft is all battery, but that’s not to say that the battery is large, considering that it’s a 3.7-volt battery that is hardly bigger than a watch battery. However, in relation to the helicopter’s 1.25-inch diameter, the battery takes up a good amount of space. The aircraft sort of looks like a tiny slim DJI with a package strapped to the bottom. When it starts flying and the rotors start spinning, it looks even smaller. I can’t describe the feeling you get when you fly it, other than to say it’s amazing. The rotors are so small and the aircraft is so tiny that it’s almost unbelievable. When you store the aircraft in the transmitter, it’s also a remarkable-looking piece of technology that fits in your pocket. The main structure of the aircraft is just a circuit board in the shape of a quad rotor. All the electronics, including the gyro, the accelerometer, the receiver, the lights and the flight controller are all on the same circuit board. There are holes cut out of the board that the motors slide into. The plastic canopy is made from 2 parts that go on the top and bottom of the circuit board. It’s all very tightly packed together and nicely manufactured. The aircraft comes in a convenient, tiny package that is small enough to fit inside a post office box. It’s a see-through package that displays the aircraft nicely and it’s easy to un-box everything in less than a minute. All you need to do is install 2 AAA batteries in the transmitter and charge the aircraft with the supplied USB charger and you’re ready to fly! The manual is pretty standard, containing basic charging and controller information. Flying this aircraft is like flying in a dream; the smaller quad rotors get, the better they fly. I’ve never seen anything so stable, and I’ve been doing this for a long time. It just lifts into the air and stays there until you tell it to move. It’s highly responsive, yet also smooth in those responses. It has a decent yaw rate for something so small, and it’s very precise. It has trims for roll and pitch, but it doesn’t seem to need any trim, given that the gyro is so precisely calibrated. I was able to fly it inside of a Mc Donald’s PlayPlace without a problem and I was able to build the smallest obstacle course I’ve ever built on my desk and fly through tiny hoops and pylons without a problem. There are 2 flight modes that you can switch through by pressing down the throttle stick like a button. There’s a low-speed and a high-speed mode; in high-speed mode, you can fly outdoors and fight wind, while in low-speed mode, you can do some incredibly precise flying in the office or around the house. This aircraft is perfect for anyone who loves flight because you can truly fly it anywhere, and it’s so quiet that it shouldn’t bother anyone. The aircraft can perform the obligatory one-button flip by pressing down on the right stick and then moving the stick in the direction you want to flip. It’s a quick, precise flip and it works great, unlike other models on the market. The range is pretty good for such a small aircraft, and the lights are very bright, which helps you determine which way the aircraft is facing. The lights are actually so bright that you can turn off all the lights around you and fly in the dark; the blue headlights can light up the whole room and it looks really cool in the dark. Suffice to say, it’s worth trying. The provided 2.4-GHz transmitter works great, has great range, stores the aircraft and only requires 2 AAA batteries to function. It also has a headless mode. In conclusion, if you only have $20 to spend and you want to buy an R/C aircraft, then you should definitely pick up a DHD-D1 Drone. It’s a smooth-flying, fully functional indoor and outdoor aircraft. It’s so tiny that you won’t believe your eyes and operates so well that you’ll find yourself staring at it in disbelief. It’s one of my favorite R/C aircraft to date and a great example of modern technology.